The Musician, according to one informed opinion, belongs to the line initiated with Velázquez's Pablo de Valladolid and continued in Manet's The Fifer. Velazquéz's placed his gesticulating figure against a neutral background such as this one, in which walls and floor are not differentiated. 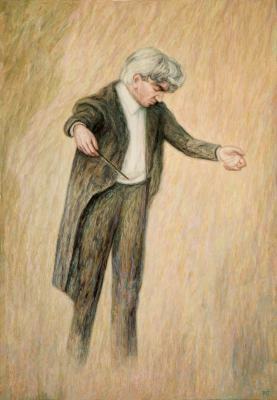 Here, the movements of the orchestra conductor seem to be shaping the dense musical atmosphere around him; indeed, so deep and compelling is the music's effect on him that he begins to dissolve into it (his feet have already disappeared). Cf. the commentaries to the paintings The Work of the Artist (I), Manual Labour, Musical Order.